An attention-grabbing Sunday Clean Technica headline on “Here’s What $7,000 Of Damage Looks Like On A Tesla Model 3” leads instead to a reasonable discussion of the nature of modern auto body repair. It’s actually a great example of how a body shop can educate a customer that what might seem to be “a few hundred dollars, a couple of days in the shop, and I’d be on my way” actually can require a great deal of effort on the shop’s part to achieve pre-loss condition, particularly on an electric vehicle. 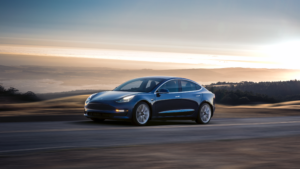 Tesla-certified Precision Autoworks — which Tesla itself used to fix a paint chip on the vehicle prior to delivery — explained that the complexity of the color and need to blend drove the repair to $6,789.77. But more complicated and labor-intensive than the painting is the “R&I” — short for “Removal and Installation.” To repair this fender apparently requires removal and reassembly of much of the left side of the car, including all of the trim pieces, moldings, and the driver’s mirror, as well as the front bumper. And when you reinstall the front bumper, you also have to “aim” (re-calibrate) the front distance sensor. The repair also required disassembly of the rear seats in order to access (and disconnect) the high-voltage battery connectors. Apparently, they do this so as not to electrocute the folks working on the car (always nice to not kill anyone). Author Chris Boylan notes that other luxury vehicles have a similar three-stage paint process, though it’s important to note that this trend might spread to mass-market vehicles as well (which the Tesla Model 3 ostensibly is); it’s already an option for low-cost Mazdas, for example. Another factor that should be considered here is that everything in New York City is expensive. The shop’s labor rate is $125/hour, which is a bit on the high side for body work, but in New York City, it’s difficult to find a body shop charging less than $75/hour. Liberty Mutual only allots $49/hour for labor, which is lower than I’ve ever seen in the city. As for Precision’s rates, a wall full of awards and a bay full of luxury cars (many of which were Teslas) in various states of repair suggest that they are earning them. They certainly had no shortage of business. And the results speak for themselves. The average New York state labor rate on Mitchell estimates — which don’t distinguish between contractually deflated DRP labor rates, rates offset by an inflated line item elsewhere on the estimate (more on this scenario shortly) or door rates — was $49.38 in 2017, according to Mitchell. CCC, which doesn’t distinguish between such labor rates either, found the national auto body rate to be $48.85 last year. 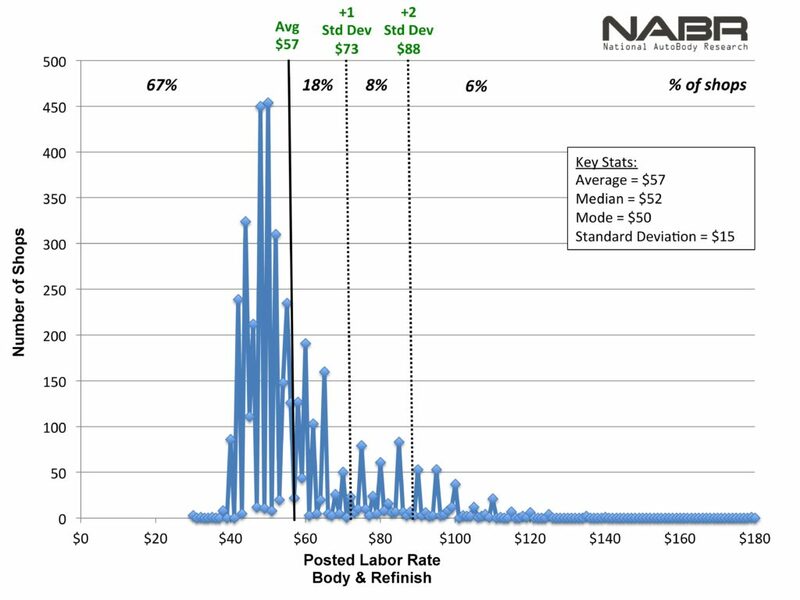 National AutoBody Research President Sam Valenzuela in early March reported an average national posted “Body & Refinish” labor rate of $57 and a median rate of $52 from the approximately 4,650 shop door rates surveyed. He said shops generally charge the same for both labor categories. Liberty Mutual’s final estimate came out at $6,256.28, indicating agreement with the shop’s assessment. As Boylan alluded in the comments section on the post, the insurer’s estimate lists $49/hour paint, body and mechanical (!) labor rates and knocks down the paint materials rate from $34 to $27 — but increases the “miscellaneous” line item from the shop’s $25 to $2,752.20. Assuming Boylan’s theory is correct, such rejiggering doesn’t seem to provide the carrier, customer and information providers with a very precise estimate, even if the check would be enough to cover the tab. For an insurer, this seems particularly shortsighted, as it obscures data actuaries and claims staff might need to forecast local labor rates, crash severity and an appropriate premium. A Liberty Mutual spokesman on Monday wrote in an email that the carrier doesn’t discuss details of its customers’ claims. He was checking to see if he could discuss other elements of the Clean Technica story and comments. The story’s comments section is also a humorous read, showing the erroneous conclusions drawn by apparent laymen and at least one poster who worked in a body shop a while ago and have no idea just how smart and complicated vehicles are today. 1. A camera is mounted above the rear license plate. 2. Ultrasonic sensors are located in the front and rear bumpers. 3. A camera is mounted in each door pillar. 4. Three cameras are mounted to the windshield above the rear view mirror. 5. A camera is mounted to each front fender. This really isn’t that outrageous. You whacked the car in about the worst possible spot from the standpoint of trying to blend the repaint. Hitting it high on the front fender means that the splash shield/cover in the wheel well is likely puckered – that rules out body filler. Repainting the entire fender means that you need to blend the paint out at least 3 feet in each direction – that would include the new fender, the hood, front bumper, drivers side door, A-Pillar and side skirts – that requires sanding, primer, base coat, 3-layers of (tricolor) paint and 3 coats of clear coat on each of those body panels. I have a Mazda6 with the premium light blue tri-coat exterior paint. Due to damage from ice built up in the wheel well that kinked in the fender when I hit a large pothole – that one pothole resulted in roughly $5,400 in body work. Keep in mind that a Mazda doesn’t have any of those fancy sensors to recalibrate either – nor are the parts in limited supply. I’d say you got a fairly common bodywork repair bill for color matching and blending a very complex paint job. However, some Mazdas actually do have those “fancy sensors” to recalibrate — as do many low-cost modern vehicles. Therefore, this article should provide a good education for adjusters and customers surprised by not just $6,000-$7,000 Tesla repairs but also the higher-cost work potentially needed on a surprising number of mass-market cars made over at least the past decade. But there’s good news as well that customers and insurers shouldn’t forget while reading stories like this. While Tesla’s technology couldn’t bail out Boylan on this one, research finds that overall, insurers are likely to see fewer accidents — which means fewer $7K repair bills. It’s also possible that the technology itself will mitigate the crash enough to still produce lower severity as well.